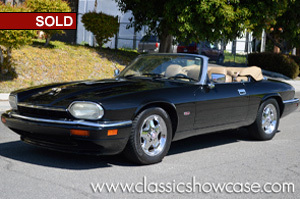 This beautiful XJS is in great condition, has been meticulously maintained and is a solid California car that was purchased in May of 1995. This is a more desirable model as it is much easier to maintain than the 12-cylinder model. The paint and interior are in very good condition and done in a great color combination of Black and Magnolia. This car has it all: walnut trim, soft leather, a comfortable ride, and that posh feeling you can only get from driving a Jag. All that is missing is a new owner! Factory options include heated seats, rear fog lights; power windows, door locks, and seats; automatic temperature control, cruise control, power operated top, chrome alloy wheels, anti-theft, and an AM/FM/CD player. The engine and mechanicals are also in excellent working order so this beauty could serve well as a daily driver and would be a great addition to any Jaguar enthusiasts’ collection. The technicians at Classic Showcase are currently performing a full service and detail to this convertible so it will be cruising ready. In 1995, the final specification changes were made to the XJS and the car was referred to as the Celebration model to celebrate the 60th year of the Jaguar Company. Celebration cars are easily identifiable by the diamond turned wheels, Jaguar embossed seats and distinctive wooden steering wheel. These latest cars are the most desirable of all the later XJS’s, especially the convertibles. The 6-liter V12 had all but disappeared by this time and was only available during the last year of production by special order. The car was discontinued in 1996, after 21 years in production. It was replaced by the XK8.